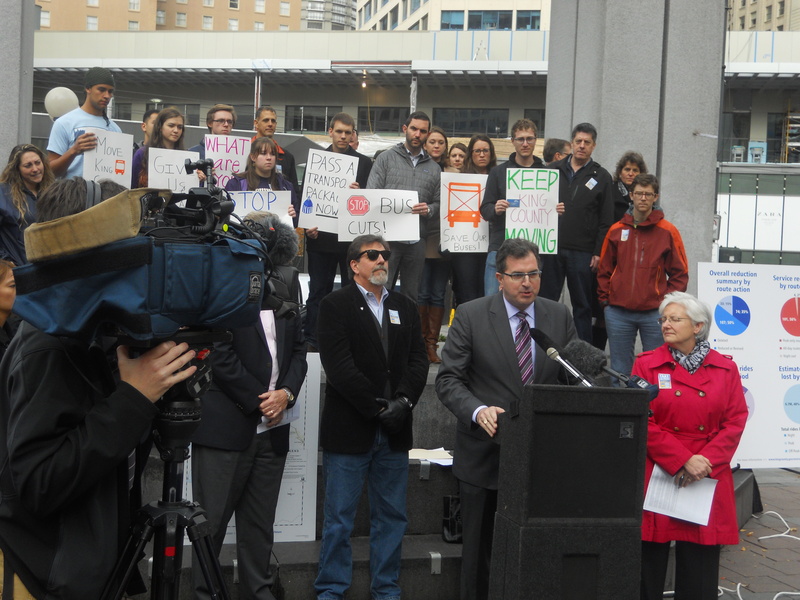 A coalition of transit supporters rallied at a press conference today in downtown Seattle’s Westlake Park. Representatives from local governments, institutions, and businesses spoke passionately about the need for the Washington State legislature to pass a comprehensive transportation package that includes the means for King County to raise new funds and prevent a 17 percent cut in bus service early next year. I reported on this issue a few weeks ago, and how it will play out still remains to be seen. Metro buses have more than 400,000 boardings per day, many of them in the downtown Seattle transit tunnel. The event was organized by Move King County Now, a partnership between a variety of stakeholders in efficient transportation and economic vitality for the region. Each had different reasons behind their demands for reforms, but the common message was that action cannot be delayed any further; all sectors of the community, from students to families and blue collar workers to downtown businesses, need a fully funded transit system. Metro’s potential 17 percent cut stems from the expiration of a temporary state-approved car tab fee next year, which was enacted when sales tax revenue dropped during the recession, leaving a $60 million budget shortfall and the elimination of 600,000 annual service hours. Over 200 routes will be effected through route changes, service reduction, and outright deletion. Metro estimates 70 percent of its riders will be affected, with up to 30,000 switching to car commutes and increasing traffic congestion for everyone. Even now, Metro’s service is below par. Less drastic cuts in recent years have led to overcrowded and infrequent service on many routes. On my commute I often watch full buses pass by, forcing me to gamble between waiting for the next one or walking. During peak periods I’ve seen others and myself forced to stand for 20-30 minutes on express routes to and from downtown on potholed and crowded streets (my trips to and from the rally weren’t so bad because it was midday). Josh Cavanagh, Transportation Director at the University of Washington, noted that this not just a local issue, but an issue for the entire state. The state legislature’s failure to pass a transportation package this year has also affected non-transit projects. Road and highway maintenance has been deferred, and much needed bike and pedestrian improvements for communities around the state are unfunded. A major project to improve the connection between Washington and Oregon was scrapped after a decade of work. Port of Seattle Commissioner John Creighton emphasized the need for improved freight connections between the seaport, airport, and warehousing and manufacturing throughout the region. Kate Joncas, president of the Downtown Seattle Association, and Howard Cohen, of the Seattle Hotel Association, spoke to the importance of transit for both workers, shoppers, and visitors in the city’s commercial core as the economic recovery continues. King County Executive Dow Cowstantine and Councilmember Larry Phillips stressed the need for the legislature to take action; specifically, they would like the state to grant permanent authority for the county to impose car tab fees and other funding sources that will keep transportation infrastructure intact. SeaTac Councilmember Mia Gregerson also spoke for the million county residents who live outside of Seattle, saying the transit cuts will disproportionally affect low-income and working class people who depend on transit for their job. 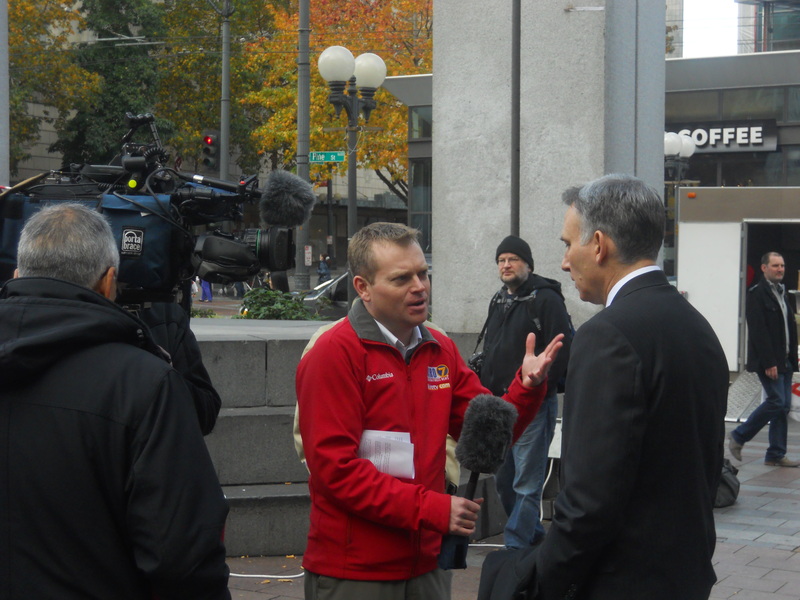 The media interviews King County Executive Dow Constantine. Washington Governor Jay Inslee has responded to recent pressures by pushing for a special legislative session to produce a tax package within a week. However, much of the motivation is to encourage Boeing to build a new aircraft variant in the state by extending a manufacturing tax break. Little details are known about the package, but it could include gas tax increases and additional weight fees for trucks. The Republican majority in the state senate may delay the speed of the package’s passing. The need for the state government to support the economic engine of Puget Sound is obvious, but it takes continuous support for Olympia to hear the need. Contact your representatives with your thoughts on transportation funding, and follow this story as it develops in the weeks ahead. 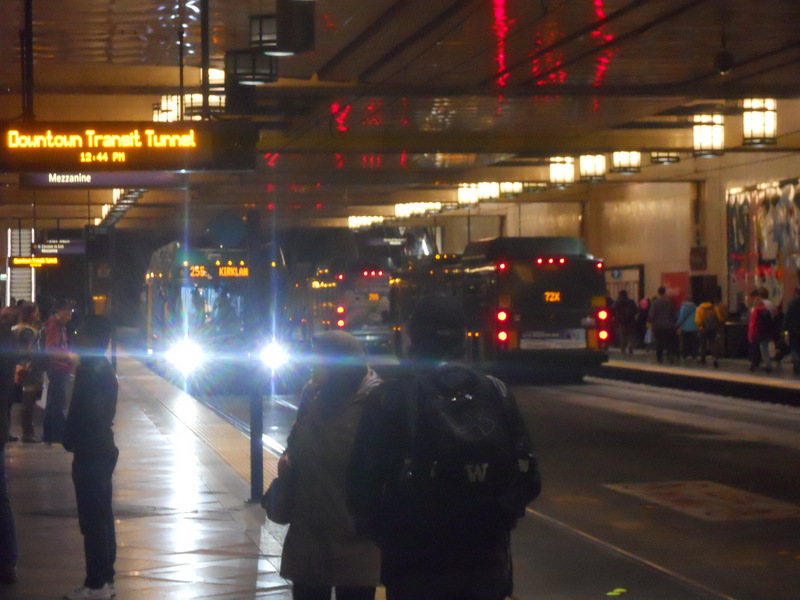 The Seattle Transit Blog has detailed reporting on the proposed cuts, and you can subscribe to email updates from Move King County Now or get involved with the Transit Riders Union. This entry was posted in Buses, Editorial, Government, Policy, Transportation and tagged bus, cuts, Dow Constantine, downtown Seattle, governor, Josh Cavanagh, King County, Larry Phillips, legislature, metro, overcrowding, politics, press conference, rally, revenue, roads, service, taxes, transit, transportation, university of washington, Washington state, Westlake. Bookmark the permalink.